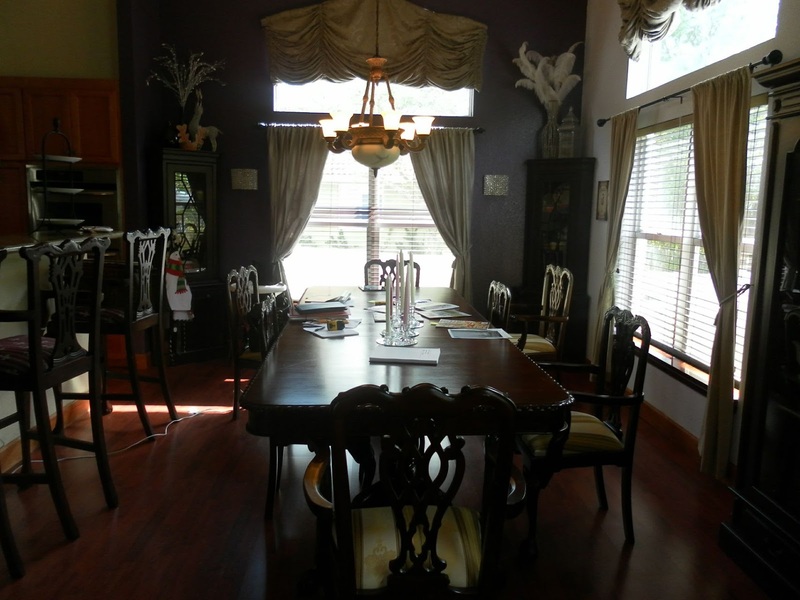 My client Samantha first contacted me in February to transform a very dreary living and dining room. She'd inherited the furniture when she purchased the home, and it was cost effective to keep them in place at the time. Let's just say, it was NOT her personality. 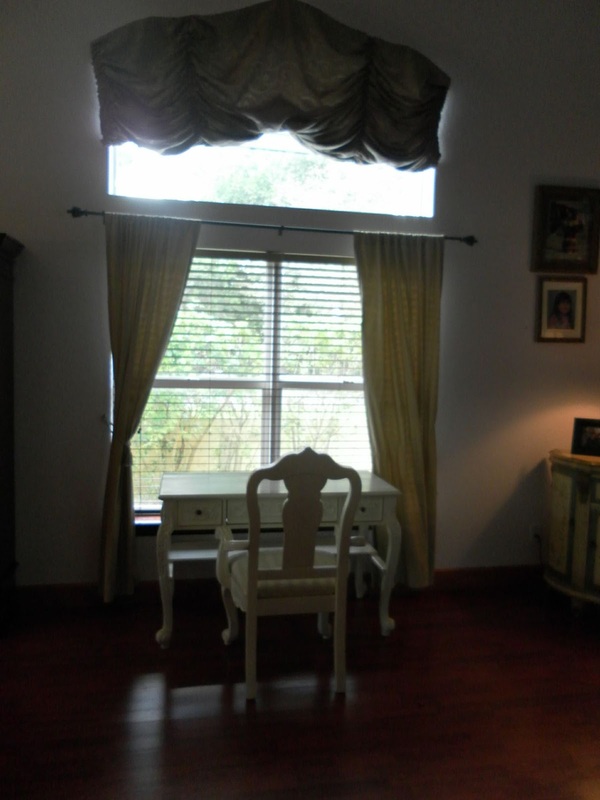 This was a matriarchal home, so she wanted it to feel pretty and soft and feminine without being childish. Pink was an option. I was intrigued. Until that request, I'd only used pink when designing rooms for little girls, but this year I've used pink in three adult spaces. Hmmm? Another trend? Let's just say it's been hella fun using this color for grown ups. You've seen some of the progress here, here and here. And now without further ado, here at last, are her new living and dining room. We were definitely trapped in the medieval times with this furniture. So dark, so dreary. Uggh. 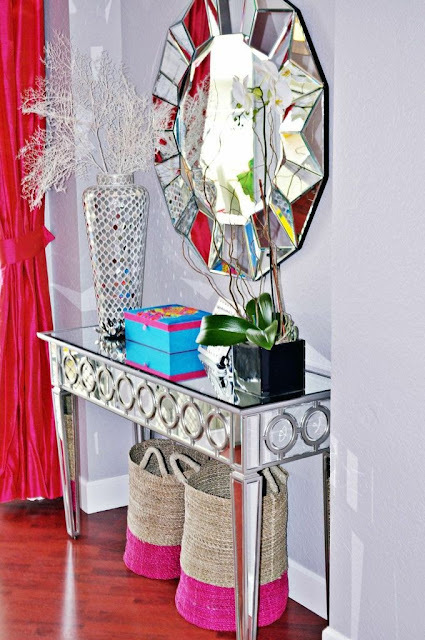 Mirrored furniture is a great way to add instant glamour to a room, plus depth as the reflective surface bounces light around the room to create a sense of an even larger space. 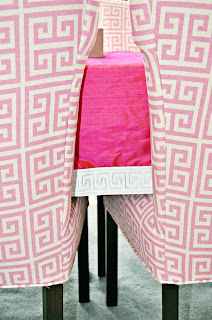 The Greek Key trim used along the curtain edges is added to the edge of this custom table runner. 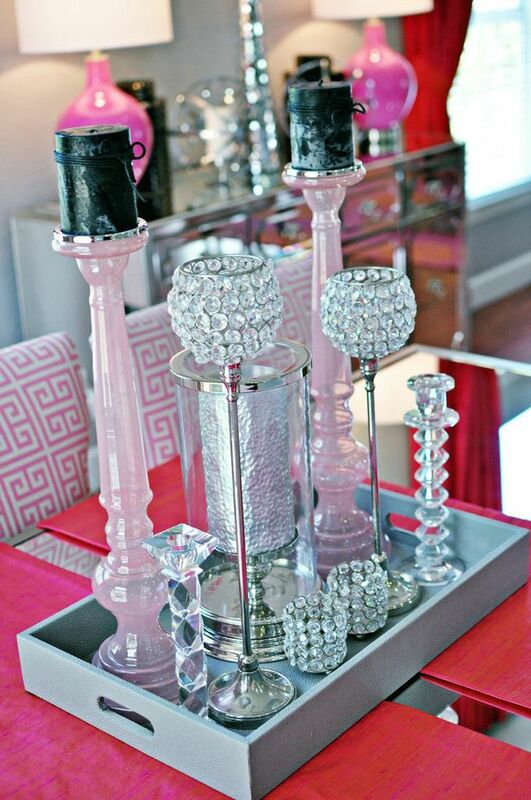 The grey of the tray used as the table centerpiece and glass candle holders, is again a great foil to balance the various pinks at the table. These Varaluz lights kinda steal the show. 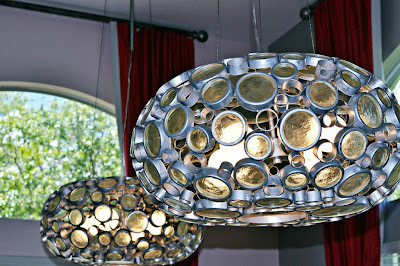 They were a budget buster but my client loved them too much to consider any other option once she'd seen these. Next up, the living room which started off looking equally sad and forlorn. This is the only before photo I have, or maybe my camera just refused to take anymore shots of this sadness, hehe. This room will now be used for adult chats so we moved the desk area to the family room, which is the project I'm working on now in Phase two. 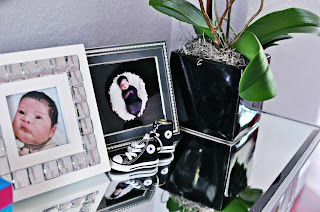 With four children and a million photos, a gallery wall was a must. It took us hours to install but it is just the personal touch she wanted to pay homage to her family. Lord Jezus, these chairs. I found them on Craigslist months ago and drove an hour to Palm Beach to rescue the unappreciated duo. Had them in my house just waiting for the right project to come along (though Xavier loved them so much I almost kept them for myself). You can see what they looked like before over on my Instagram page. 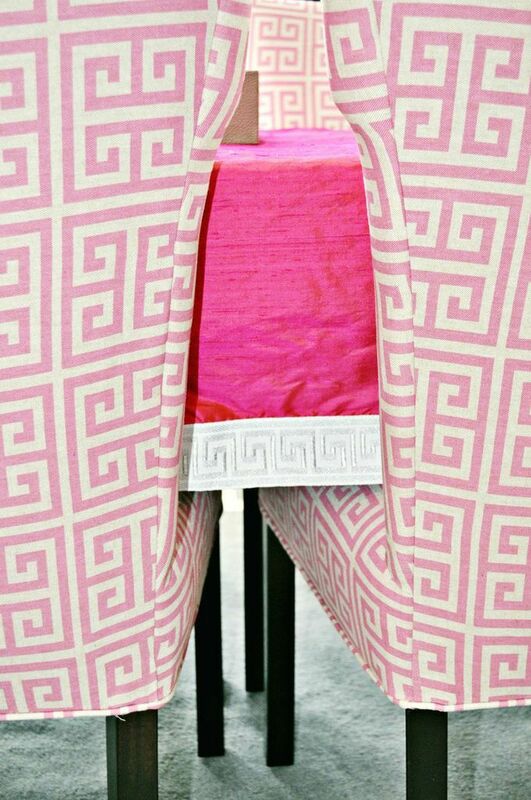 Y'all know I loves to mix fabrics on chairs so this time would be no different. Samantha gave me free reign to design this and had no clue what they would like until reveal day. Let's just say she was kinda speechless and kept saying, "the chairs, the chairs!" Thanks a million to Tamisha (our new assistant) and the ladies at Designer Discount Fabrics who waited patiently that Saturday evening as I agonized over my fabric combination. Love you guys! That rug is another show stopper no? Orange and pink? Two of my favorite colors to boot. Notice too the mix of shapes in this space, the hexagon shaped coffee table, rounded end tables, curved Louis chairs, all balance out the harsher edges of the dining and buffet tables in the neighboring dining room. 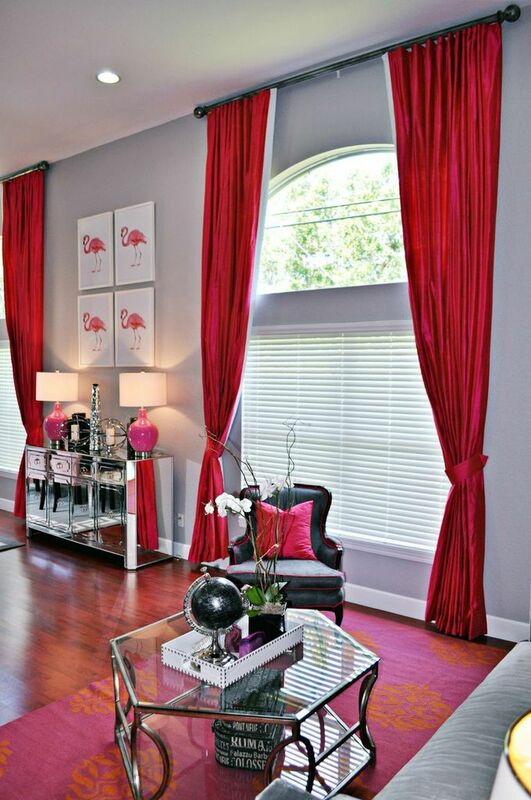 Pinks, purples, blacks and some bling on the throw pillow add the finishing touches to this space. Last but not least, the foyer. The front doors are rarely used, since there are additional access doors from the family room, but that doesn't mean we would leave this area looking all bereft, especially since it's right outside the master bedroom. We waited weeks for that foyer light and it is even more breathtaking in real life. Well worth the wait that one. A mirrored console with personal mementos like the newborn shoes of her first born were just the final touches we needed for this area. Baskets to store some toys, or the kids shoes as they come in and out from the pool area, were simply the practical but fun item to add as well. There ya go. Thanks so much to Samantha for allowing me to transform her home. She's still swooning and cooing over her fourth child, delivered in the midst of all this mayhem. Thanks too for your patience as we sacrifice frequent blog posts to focus on these projects. Much appreciated. That's all folks. Any faves? Thoughts? Love to hear from y'all as always. 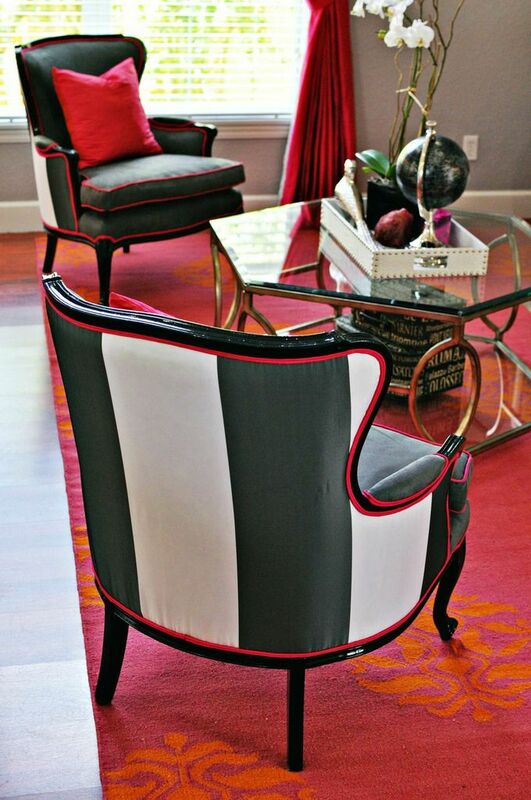 Accent Chairs: Custom design by Nicole White Designs; Fabric: Designer Discount Fabric. * Not all items purchased are still available. Wow, what a showstopper. Love the flamingo prints, the lights and the textiles! Thanks lady! I thought about you as I purchased those Flamingo prints. Hope you're having a fab summer. I can't express how great and different the BEFORE AND AFTER are! I love that you use Z Galleria as one of your sources. I notice very few others that do and I LOVE that store!!!! Omg!! I love your work! And only by reading this post I already learned so much!! You have both talent and technique and are from now on an inspiration for me... I mean it! The colours are...gorgeous, the drapes are breathtaking! Those mirrored pieces are to die for and the chairs simply.. fit the look so perfectly! I love it all! Wonderful transformation, I love your skills!! You're so kind! Thanks so much for the kind words. I love what I do and I hope it shows with each project but yes, very blown away by this transformation for sure. I remember the old furniture and am just happy it's no longer around. The after is unrecognizable from the before shot. 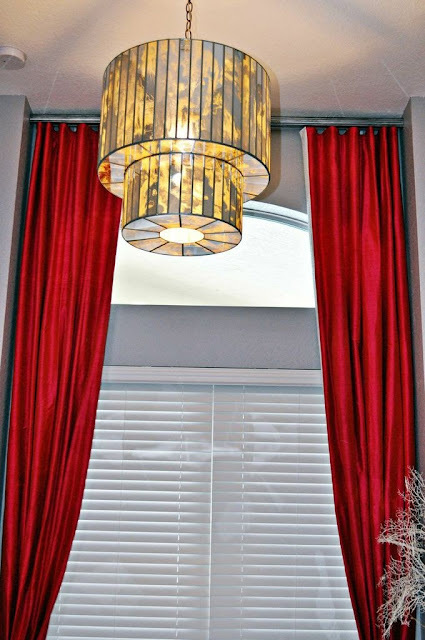 You killed it, those drapes, the chairs with the piping...I can't take it. I also really love the drapery hardware. This is why you are always busy. Thanks lady. Really worked overtime on this one. Leave it to you to spot that hardware. Wooden rods, sprayed silver with a hidden ripper fold track system. This is why I can't wait til you get here! I'll be a frequent guest to get some much needed rest. Nicole!!!! YES to the pink and EVERYTHING you did! I was scrolling up and down a couple times before commenting. I love the glam details, the bling, those chairs! I also love that rug! You've got the Midas touch darling. If we lived closer, I would whip up some oxtail in my orange pot and we would celebrate another amazing transformation over dinner! It's hard to believe it's the same place! LOVE all the textiles. Those chairs are killer with the bright piping. Wow. Can not believe this is the same room! LOVE pink for adults! Def need a pink moment in my new place. 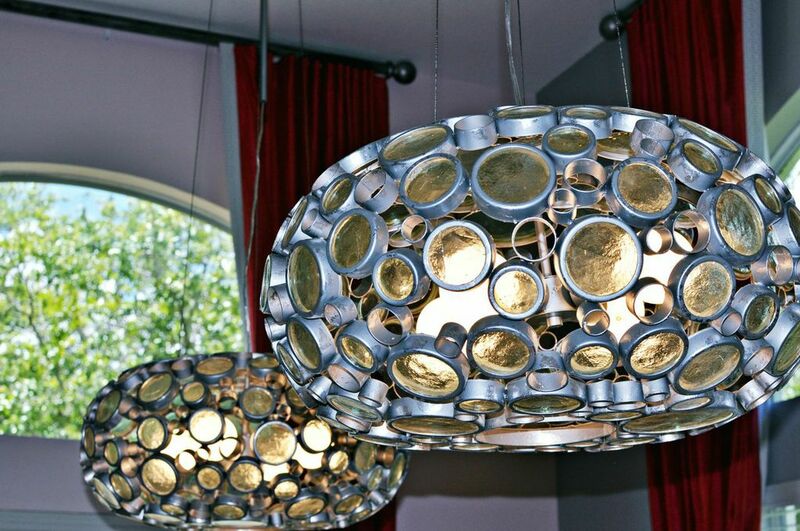 Did I also mention that I need those UFO chandeliers? Oh my goodness, this is AMAZING!!! 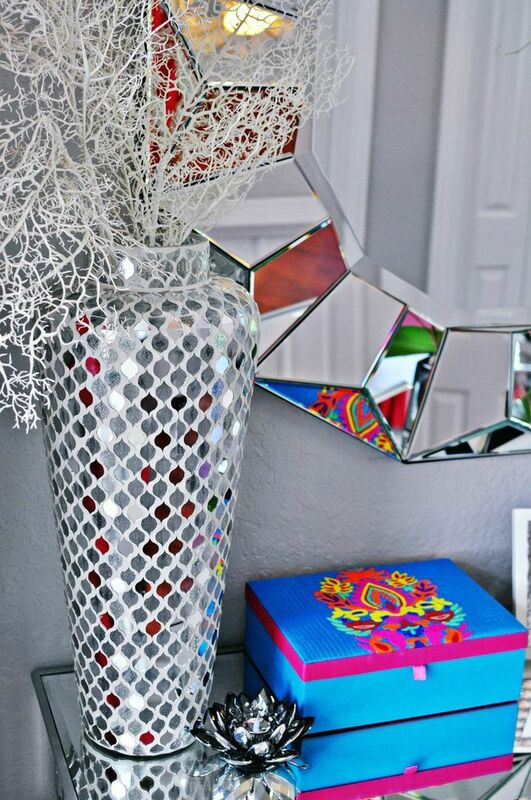 So Florida glam, it is just too gorgeous for words!! Fantastic job! Awww, thanks lady! We need to do that lunch soon no? Thanks lady! How are things in Barbados? and why are you a "no reply blogger"! change that! Wow! This is true glamour. 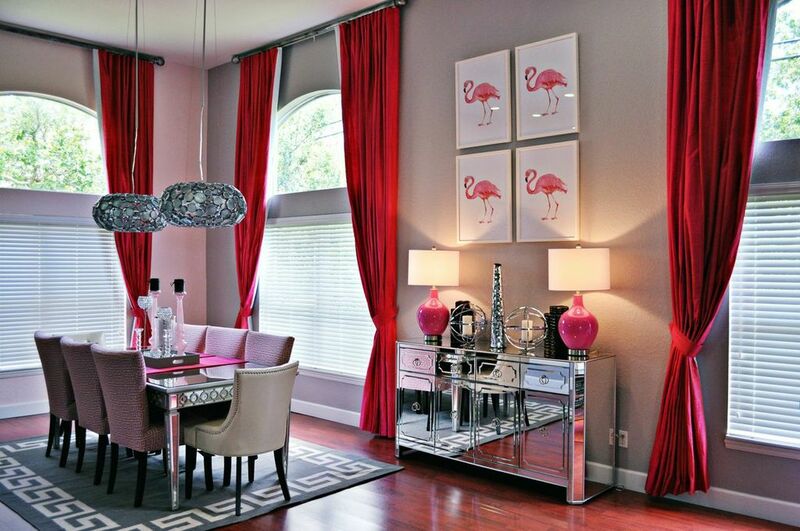 Love the the dining room--mirrored piece is so grand and the pictures above it. Your LR chairs turned out amazing. Ok. 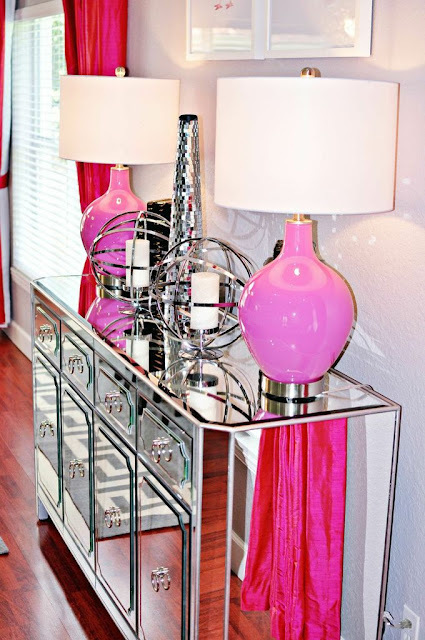 So you already know I love all the reflective decor and mirrored furniture. I also love the feline black lacquered figurine #catlover and those two living room chairs. My god, the pink piping really sets it off. Oh and the lighting. Love it. great job chick! 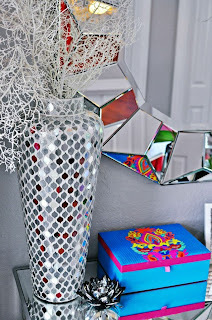 Holy makeover a room!!! I can not believe it is the same space....go girl!